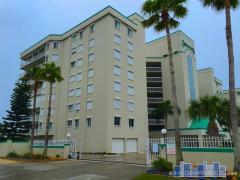 Gardenia is a 9-story high-rise condo tower located on the water in Indian Harbour Beach, FL. Gardenia features private balconies, a community pool, and in-unit laundry. Have any comments or questions about Gardenia Condos? Ask your question and/or share your thoughts about this Building. Do you have monthly rentals? We looked at a unit to buy in the condo. We have a 9 yr old Airedale that weighs 50 lbs. do you grant wavers for owner/buyer for the 30lb dog limit?